Silicon Valley has it all -- money, tech, drones, risk-takers. Throw fashion into the mix and you get a show highlighting the ingenuity and idiosyncrasies of the startup world. Silicon Valley Fashion Week, kicking off Thursday in San Francisco, is a three day affair that unveils the latest in wearable tech, commuter clothing and crowdfunded fashion. Positioned as the antithesis of a conventional fashion show, it's the brainchild of Betabrand which first held the show last year. Betabrand, based in San Francsico, is best known for putting out crowdsourced fashion hits like the "Poo Emoji" shirt and the Executive Pinstripe hoodie. Unlike typical fashion shows, this one will showcase styles that are already selling or about to hit the market. In true geek style, the extravaganza will feature drones -- instead of human models -- that will fly some of the looks down a 20-foot runway. There will even be a lifesize version of a conventional arcade claw machine game. The twist is that humans will become the claws and have to maneuver themselves to pick up a prize from the bottom of the machine. "It's going to be all about fashion, fun and innovation," said Chris Lindland, Betabrand founder. 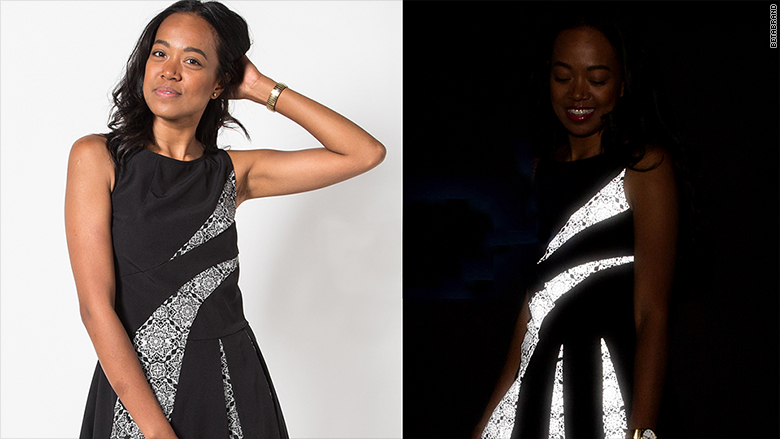 Betabrand's 3M dress has reflective panels with millions of tiny glass beads. It could pass as regular workwear during the day and transform into an attention-grabbing outfit at night. Silicon Valley's cycling culture has already made reflective clothing popular from a safety standpoint, said Lindland. "The 3M dress is showing another dimension of what's possible with reflective fabric," Lindland said. 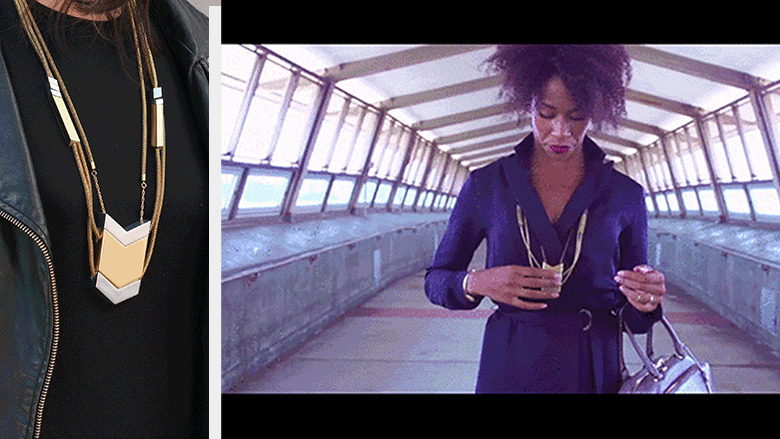 Betabrand launched the dress ($178) less than a month ago and has already sold a few hundred. If you work in Silicon Valley, you better embrace hoodies. "Hoodies are my business suit in the Valley. But what really bothers me is having to pull up my sleeve to look at my watch," said Mark Solomon, head of industrial design for smartwatch company Pebble. So he designed the Smarthole Hoodie. "It's tailored with a hole in the sleeve where you'd typically wear your watch," he said. What if you don't want your watch visible all the time? "We're toying with a flap to cover the watch for when you want quiet time," said Solomon. The hoodie is Solomon's personal project but he's hoping for it to possibly become a Pebble-branded item down the road. 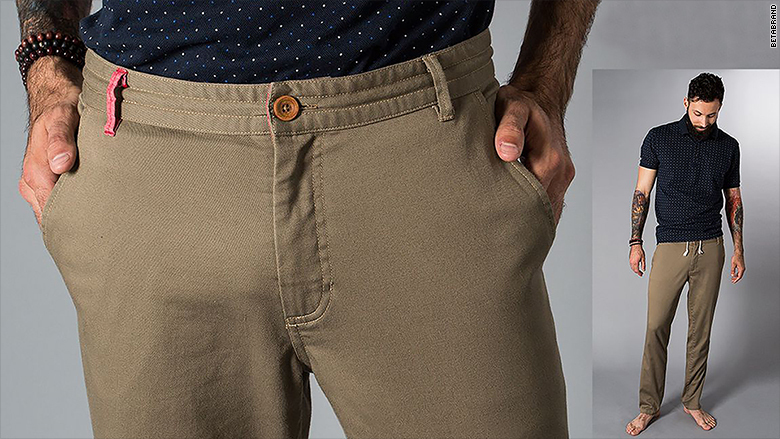 Fresh off the heels of its popular work yoga pants, Betabrand is showing off the Sassy pant. It's a legging-skirt hybrid that's bike friendly and transitions from office to leisure wear. The company launched it in September and has already sold 600 pairs. TshirtOS from Switch Embassy are washable programmable T-shirts. "Using the app, you can put text or images on the T-shirt," said Alison Lewis, founder of Switch Embassy, a fashion technology lab in San Francisco. 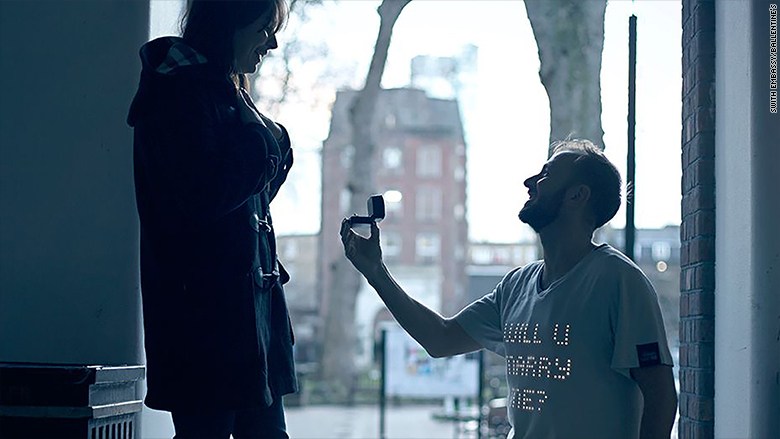 The wearable tech shirt features a bright white LED panel in the front that is programmable. It works with an app to display any message, image or animation on it. 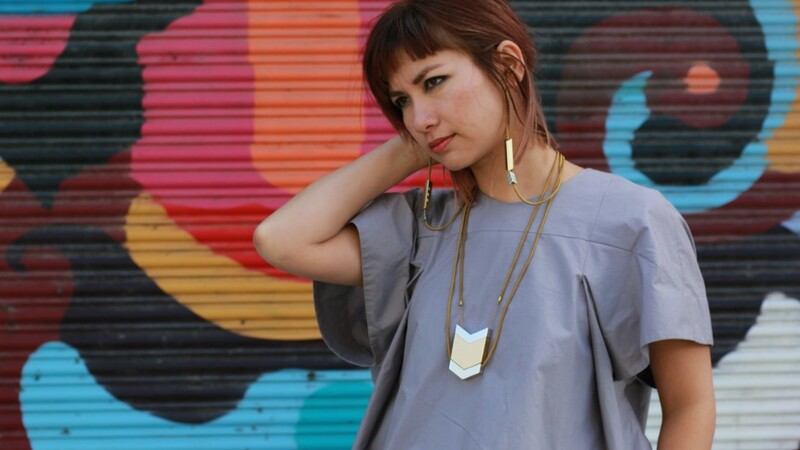 Tangled earphone cords bunched up at the bottom of her handbag drove Aniyia Williams, founder of Tinsel, to design the Dipper audio necklace. It looks like a piece of jewelry, but it's really headphones in disguise. Made of stainless steel and aluminum, it neatly conceals the earphones, wires and jack. It also has remote-control volume and microphone capabilities. Betaband's "Slackies" are a variation on dress pants and sweat pants. "We've engineered these to be a work into the weekend item and we're also taking boredom out of khakis," Lindland said. Unlike regular khakis, which are made from thicker material and tend to be stiffer, Slackies are made from a mix of hemp, cotton and lycra fabric. The combination makes the pants softer and stretchier, and there's a drawstring hidden in the waistband if you don't want to belt up. For startup folks who travel a lot, comfort is paramount. 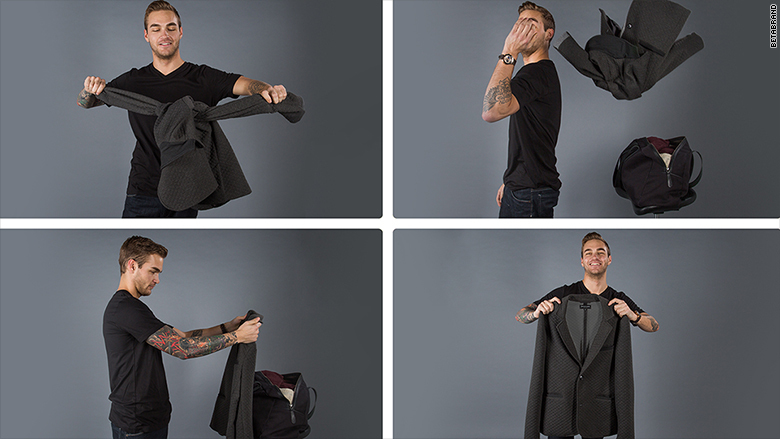 The quilted travel blazer is made so it never wrinkles. The wrinkle-free material comes from a special construction which doesn't allow it to hold a wrinkle. You can roll it, bunch it, sit on it and it still retains its shape minus wrinkles. An added bonus: plenty of hidden pockets everywhere, even in the sleeve for easy access to your passport. Silicon Valley loves multipurpose clothing. 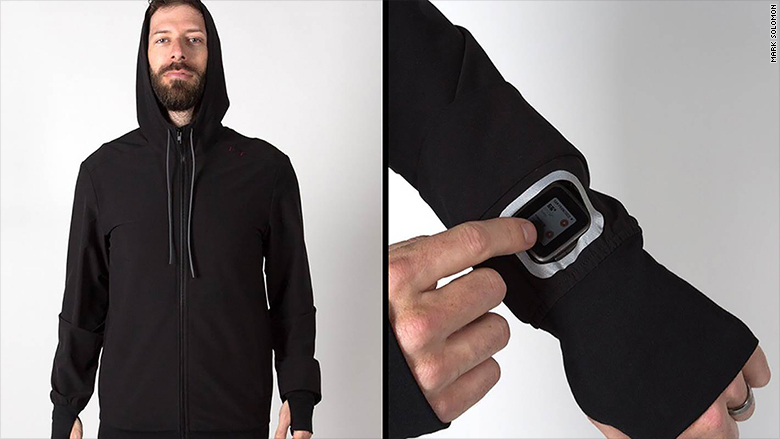 Rumpl Wrap from Betabrand is a jacket that unfolds into a blanket. 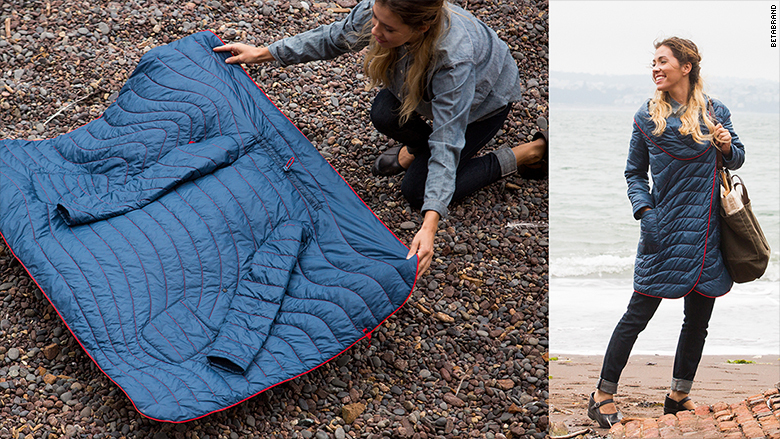 So you can go from hiking to roasting marshmallows without breaking a sweat.